Episode 64: Do I REALLY Need to Create Content for My Funnel? 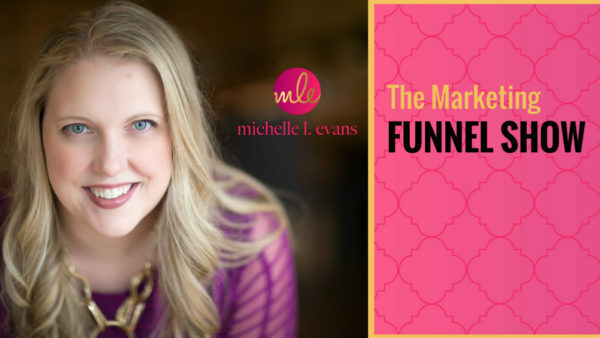 When we talk about marketing funnels, there’s often one piece of a funnel that gets left out — your warm-up content — or as many people call it, content marketing. Now, before you roll your eyes and tune out because you’ve heard it all before, I want to invite you to stick with me. Recently, I saw my virtual marketing mentor, Seth Godin, talking about content marketing. Godin said that content marketing is “the only marketing left” — it’s authentic, useful and perfectly suited for our “always-on” culture. Seth Godin has always been a visionary and a leader — and I’ve obsessively followed his work since my college days. I trust his guidance for the future of marketing, and there have been a number of studies that back him up. In fact, there are some recent studies I’ve seen that have found three really important points about content marketing. #1. According to one study, 86% of consumers say that authenticity is a key differentiator that leads to a purchase decision. 86%! That is a really, really big deal, and what better way to authentically show up than to create content that connects and engages your audience? #2: 73% of consumers would pay more for a product if the company behind it promises transparency. And you can ABSOLUTELY use content to be transparent about your process, your work with clients and/or students, your journey and more. #3: 94% of consumers say they would remain loyal to a brand that provides complete transparency. This is so powerful — brands, companies, and people that provide complete transparency build trust. These are BIG shifts in how your audience wants to consume content from you. And make no mistake about it — they DO want to consume content, and I’m paying attention because these are important shifts. You see, creating content used to be hard for me. REALLY HARD. And for a very, very long time, I struggled with it. I didn’t know what to talk about, who I was talking to, how to create quality content, or even what I’d do once it was created. Content creation felt like a HUGE waste of time, brain cells, and effort to me for a long time. Let’s be honest. Even if you LOVE it, creating content takes work. It takes discipline. It takes focus. It takes a process. It takes a bit of thought. Honestly, for a long time, I thought I didn’t have the skills to do it right, but a couple years ago, I realized how important content marketing was and how straightforward and SIMPLE it could be if I got out of my own way. I also found out how CRITICAL it was to create the RIGHT kind of content — not the kind of content I wanted to create but content that served my audience. No matter what your business focus, this is true for you too. Let me take you through my “a-has” so that you can create content that attracts and engages your ideal audience and putting them on the path to working with you. There may be some people who are just born into greatness, but those people are very few and far between. Honestly, they’re pretty unrelatable because we want someone who had a struggle. For example, Oprah is the QUEEN of letting us know that she started at a very humble place, she struggled, she had to deal with a lot of stuff. Yet, she keeps showing up. I think that’s why she’s so beloved even after all these years — people relate to her. They know she’s had to figure some stuff out to get as far as she’s gotten. Most of us started into our business for a reason, and that reason is usually really personal and ‘REAL.’ That’s why it’s important that we share our starting place with our audience. What did we struggle with? Why is this work important to us? Business owners suffer from the curse of knowledge — myself included. We wouldn’t have started our businesses if we didn’t LOVE our topic area. Over the course of my career, I'll have read at least two thousand books on marketing, psychology, messaging, storytelling, digital marketing and more — but you most likely haven’t. You may not even really like marketing, and that’s totally okay because you do NOT need to know as much as I do. It’s MY job to give you the right type of information, stories, and most importantly, inspiration at the right time. If I lead with my marketing funnel process from the get-go, that would KILL any interest in what I do. It’s important that you hone your craft and have a process for your work, but don’t lead with that. Lead with something inspiring, exciting or even where you started and why this is important to you. Feelings can look, sound, and be authentic to you. Think about some of your favorite creators — do they give you hope? Do they make you laugh? Do they make you pause? Do they make you question? Do they make you feel inspired or grateful? Be a real person when you create your content, not some robot that spits out keyword heavy updates so that you score points with Google. Figure out what kinds of feelings move you and how you can use those feelings to move your audience. When I took off the pressure and focused on connecting, engaging, and serving my audience, creating content became so much easier. Clients came easier because they connected with the stories and experiences I shared. I was no longer selling to sell; I was sharing to invite clients to work with me. Take time to brainstorm. Set your timer for 15-20 minutes, and brainstorm how you could create a different type of content. Focus on how you can use your learning moments, a-has, and feelings to engage your audience.